Passionate about wines, this was just the right river cruise. And I learned, it’s not about red or white wines and how to pair with food, it’s drinking what you like. That’s a refreshing concept. I boarded the AMAWaterways ship in Basel, Switzerland on a chilly November afternoon but once I stepped on board, the chill was chased away by the friendly reception I was given. A welcoming glass of champagne reinforced my pre-travel thoughts, a cruise about wines will be a fun. Passengers continued to stream in and settled into chairs and couches in the lounge. I soon realized this homey area was the meeting spot for friends and family with casual conversations flowing as much as the wine. A talkative group of about 20 people gathered together near the back and rearranged the furniture to be in communication with each other. They were members of a California wine club and the owner and wine maker were on board, too. Curious, I asked our cruise director why a California wine company is on a European wine cruise. 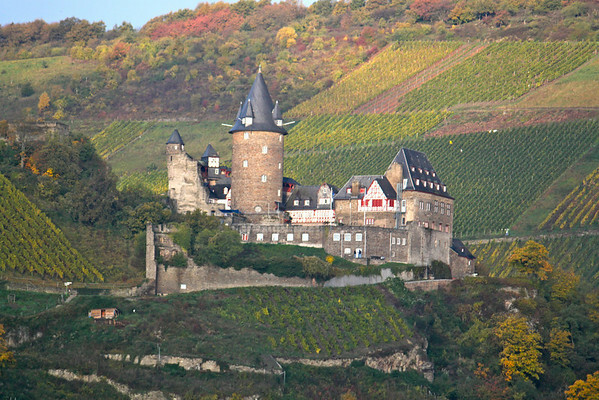 After all, this region of the Rhine is known for excellent wines. He explained that some wine themed cruises host a winery from the US to lead discussions about wines and engage the passengers in wine talk. 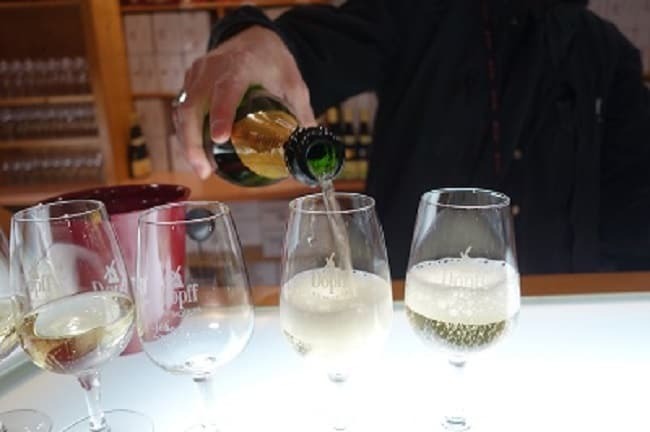 Wine lovers book the cruises to explore old-world vineyards while swirling and sipping varietals passing by the castles on the Rhine. Oak Farm Vineyards from Lodi, California was the host winery and Dan Panella, the owner and his wine maker Chad Joseph were ready for the week ahead of grape and fermentation talk. And wine club member, Rick, was very ready too. His thirst for wine could not be hidden. I had to ask him, why European wines and why Lodi, I mean, where is Lodi? Rick let me know the Wine Spectator named Lodi Wine Region of the Year in 2015. 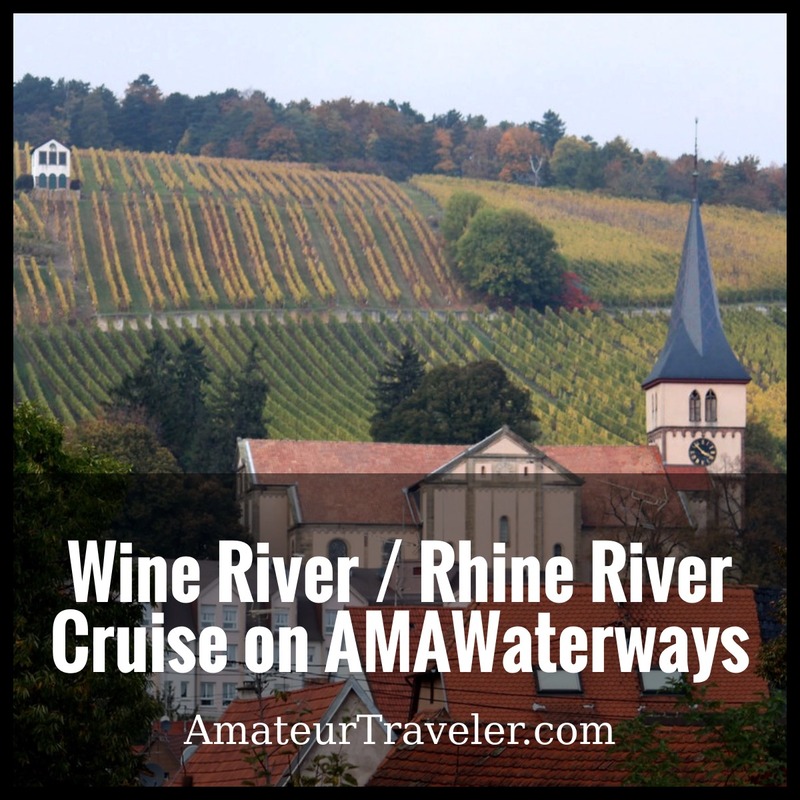 Cruising the Rhine was sure to be enlightening, if not entertaining. 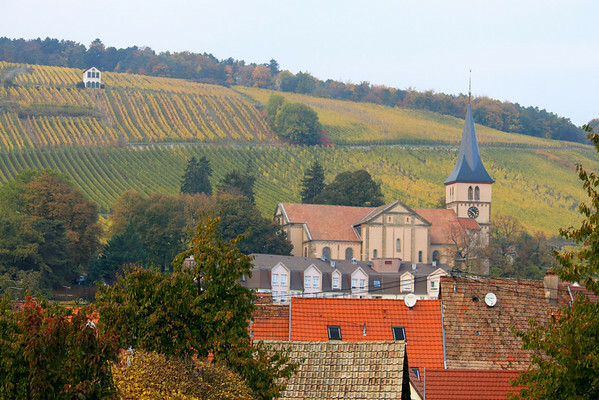 Once embarked, we headed for the Alsace wine region in southern France and very near Germany. It is the capitol for white wines, especially Rieslings and Gewürztraminers. Driving through the region, the hillside became noticeably landscaped with perfect rows of vineyards. I could only imagine how many generations of families planted and harvested these grapes through good and bad times. 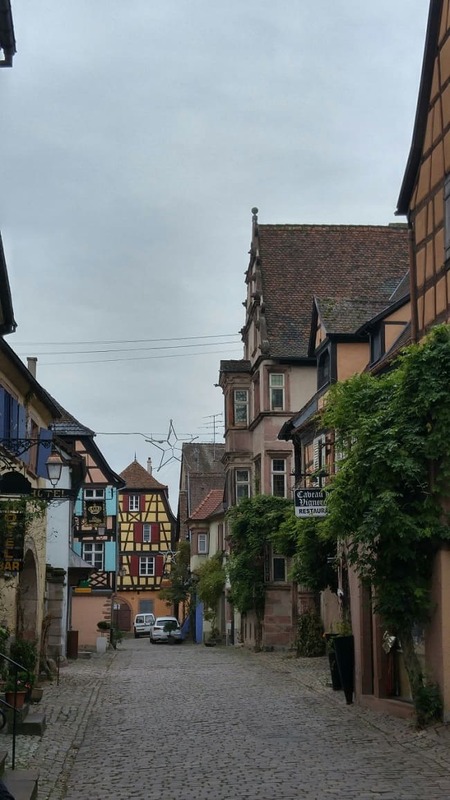 Past the last curve in the road, colorful medieval style homes and small businesses decorated the village of Riquewihr. Wrapped around cobblestone streets, which dipped into the village, surely this is what post cards are made of. The area has been influenced by France and Germany, since both countries ruled at different times over centuries. German sounding names and French macaroon stores dotted the main street. Alsace winery Dopff Au Moulin, has been family owned since 1574, and produces different varieties of white wines. A tradition began during the second German Empire (1871-1918), of eating locally made Kugelhopf cake while drinking Gewürztraminer wine. Still to this day, when attending a special event, a welcoming gesture is to offer a glass of wine and a slice of cake. And that’s exactly what we did in this tasting room. Interestingly, the cake, resembling a bundt cake, is not too sweet and pairs well with the sweet wine. I asked if the cake was made on premises and he whispered, up the street is the bakery. My nose found the bakery and cakes were in the oven and finished baking as I stood watching. With or without wine, the aroma was intoxicating to me. The baker carefully handled the hot cake pans and finished each one with a dusting of powdered sugar. 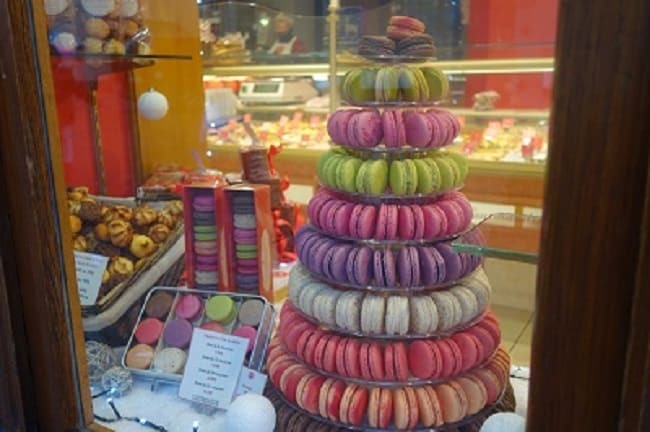 Surely, it wouldn’t be France without macaroons and the bakery’s window display of the little colorful round cookies, stacked in the shape of a Christmas tree was eye catching. Add the sound of the cork popping from local bubbly Brut and my paradise was found. As all good things come to an end, our Captain’s farewell dinner featured AMA’s Chaine des Rotisseurs menu. The ship is a member of this prestigious culinary society and thoughtfully paired Oak Farms Wine with each course. I particularly enjoyed the Foie Gras and walnut brioche with California’s Albarino wine. Mr. Joseph explained high acid content in the wine cuts the high fat content of the foie gras. Proven once again, be it old world or new world wines, the simple things in life are the best. Good food and wine shared with family and friends is the ultimate pairing. 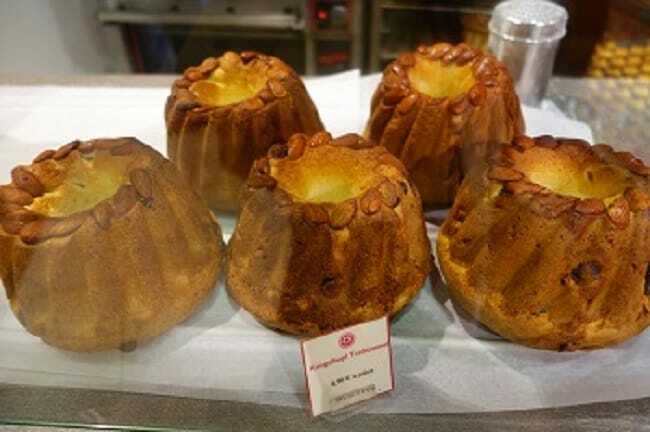 When I returned home, I pulled out my German bundt cake pan and chilled a bottle of French white wine. My arriving guests would be welcomed in a new way now. Place all ingredients, except for the orange peel and raisins, into a mixing bowl and stir until the texture is smooth. Add the fruit to the dough. Let the dough rest for at least 15-20 mintues so it can rise. Divide the dough in two, and place into two well buttered Bundt pans. Let the dough rest at room temperature for an hour. Bake in a preheated 375 degree farenheit oven for 35 minutes. Makes two Bundt cakes. Disclaimer – I was a guest of AMAWaterways, however my opinions are my own.